In light of our ethics and the values we believe in, the choice for our raw materials focuses on environmental fibers: organic cotton and natural wool. Privileging natural and non-synthetic materials allows our clothes to have a lower environmental impact. All our materials are carefully selected from our mills in France and Spain, which allows us to control the manufacturing conditions of our yarns and guarantee the quality of materials, respectful of mankind and the environment. It is no wonder that half of all the fabrics produced around the world are made from cotton. Soft and comfortable, this natural material is also hypoallergenic, healthy for your skin, and breathable. The cultivation of conventional cotton represents 25% of pesticides used globally. Out of respect for our planet, all of our cotton garments are made of 100% organic, undyed cotton. Our cotton is grown without using toxic pesticides or fertilizers, free from genetic modification, and doesn’t use irrigation (only rain water). Its impact on the soil and water is greatly reduced and its culture respects the plantlife as well as the wildlife. Our cotton comes from Brazil, it is a traditional perennial Moco cotton, a variety native to the semi-arid northern region of Brazil. Contrary to popular belief, white is not the original color of cotton. Thousands of years ago it used to grow in many different colors such as off-white, brown and green. We use a natural, undyed cotton that is pure and biodegradable. Certified GOTS and OCCGuarantee. GOTS stands for Global Organic Textile Standard and sets the highest ecological, sustainable and social requirements for organically and naturally produced fibres. Easy to take care of, cotton can be eco-friendly washed. Learn about more cotton care. A natural resource, biodegradable, renewable, wool is the material of choice for its many virtues, especially in terms of sustainable development. A noble material, wool will stay with you durably and comfortably. If maintained with care, it will retain its flexibility, softness, colors and hold for years. Easy to care for, wool stays clean easily as it does not retain dust and gets dirty very little. 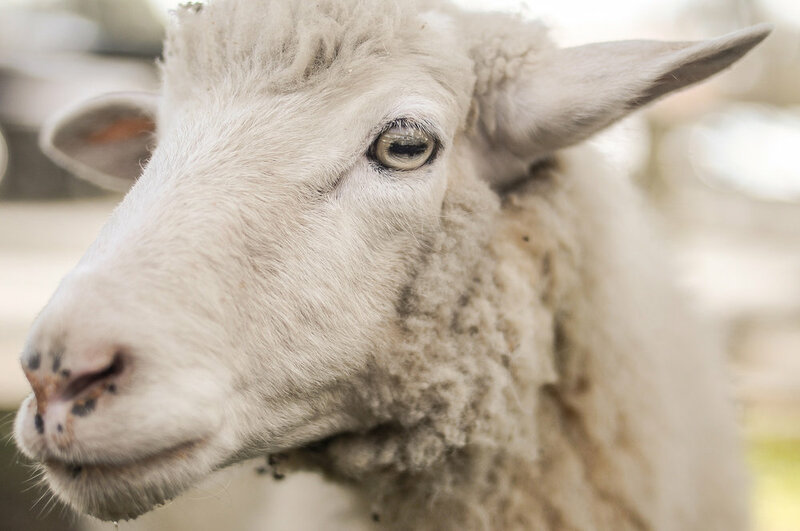 Learn more about wool care. A bit of history on this precious wool. Between the twelfth and sixteenth century the Spaniards held the monopoly of its production. Until the 17th century, the export of sheep outside the spanish borders was pursued and sanctioned by the death penalty. Today Australia and New Zealand are the world's leading producers. We wanted to work solely with local wool, sourced exclusively in Spain, in order to reconnect with a local heritage without sourcing from countries on the other side of the world. Particularly elastic, lightweight and resistant, merino wool is also renewable, recyclable and biodegradable. Thermoregulating, this very soft wool does not scratch and is an excellent insulator: warm in winter, cool in summer. Long and shiny, its fibers make knits of exceptional flexibility and beauty. Just as soft and more resistant than cashmere, warmer than merino, Yak wool is an exceptional product of extreme softness that is naturally antibacterial and allergenic. Under a very thick and very rough hair, the yaks have a very warm down and an incomparable softness from which is made the wool. Yaks lose this down in the spring when moulting, which clings to the bushes of pastures. So we talk about "harvesting" or “hand-picking”, a method which is more ecological than the classic mowing of animals. Because of their nobility and rarity (each yak will give about 100 grams of down per year) this precious down has been reserved for centuries to the emperors of the Forbidden City. Yak wool is purer and more natural than other types of wool. Indeed the Tibetan climate does not allow the animal to secrete ooze (fat). As a result, yak wool does not require the chemical scouring treatments that usually result in an irritating or rough wool. Mohair has the look, feel and shine of silk. Feather-light and wrinkle-resistant, our mohair comes from the Peruvian and Bolivian plateaus (and not from South Africa where farmed goats are often very badly treated). Mohair wool is made from the wool fiber produced by the angora goat, named after the Anatolian plateaus in Asia Minor, and more precisely the province of Ankara, once called angora. A naturally high quality fiber, alpaca is one of the softest materials, and was once considered so precious that it was reserved only for Inca kings! It is a rare fiber (an alpaca will only provide 2 to 3 kg of hair per year), but it is softer, stronger and lighter than sheep's wool.